Mumbai: Early trends show India’s biggest firms have cut back on pay increases for their top executives. 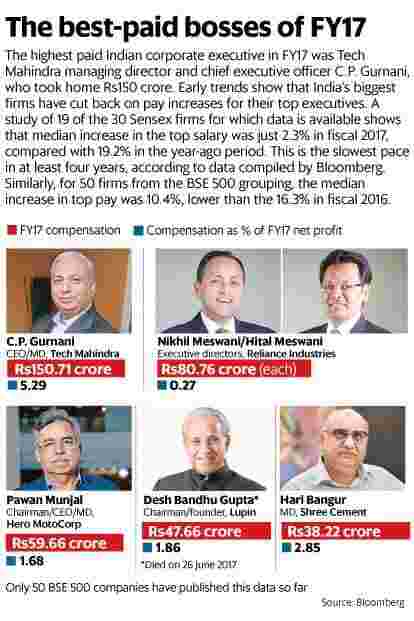 A study of 19 of the 30 Sensex firms for which data is available shows the median increase in the top salary was just 2.3% in fiscal 2017 against 19.2% a year ago. This is the slowest pace in at least four years, shows data compiled by Bloomberg. Similarly, for 50 firms from the BSE 500 grouping, the median increase in top pay was 10.4%, down from the 16.3% in fiscal 2016. The study looks at the single highest remuneration paid in the year by the company, irrespective of designations such as chairman, chief executive officer or executive director. Bloomberg data also adds stock options to the total compensation figure wherever it is available. For the blue chip sample set, the top executive remuneration has grown at a slower pace compared to overall employee costs for the first time in two years. Overall employee costs grew 9.73% for this set of firms, albeit at a slower pace compared with 11.14% in FY16. Employee compensation for the BSE 500 companies rose faster at 10.76% in fiscal 2017. “Salaries and bonuses of executives in under-performing sectors like information technology, retail and pharmaceutical dropped due to industry-specific woes, which hampered business," said a consultant from KPMG India who wished to remain anonymous as he isn’t authorized to talk to the media. Data shows top earners in companies such as Infosys Ltd, Wipro Ltd and Dr. Reddy’s Laboratories Ltd taking a pay cut. The highest paid corporate executive (from data available so far) was C.P. Gurnani, managing director and chief executive officer of Tech Mahindra Ltd, who took home Rs150 crore, shows Bloomberg data. The payout was 16% lower than the Rs179.5 crore given to vice-chairman Vineet Nayyar in fiscal 2016. Among the Sensex firms, Nikhil Meswani and Hital Meswani, executive directors at Reliance Industries Ltd, drew ₹ 0.76 crore, higher than chairman Mukesh Ambani, who has capped his pay at ₹ 15 crore for some years now. The Meswanis’ higher payout was owing to Rs64.18 crore of stock options. They were followed by Pawan Munjal, chairman, managing director and chief executive officer of Hero MotoCorp Ltd, who drew Rs59.6 crore, 3.9% higher than a year ago. The sharpest cut was seen in ITC—the firm’s highest payout fell 82% to Rs2.7 crore to Nakul Anand. This was followed by Infosys Ltd’s Vishal Sikka, who was paid 67% less than a year ago at Rs16 crore and Satish Reddy, chairman of Dr. Reddy’s, whose Rs7.24 crore payout was nearly 40% less than fiscal 2016’s remuneration to G.V. Prasad, co-chairman and chief executive officer. With GST expected to shake up things in the first half of this fiscal year, there might not be a sharp rise in 2017-18 as well. KPMG, in its India’s annual compensation trends survey, which sampled 263 companies across 19 sectors, has projected a decrease in average increments in 2017-18. “The maximum decrease is projected by the banking and financial sector where financial services sector has decreased the increment to 8.1% from 9.7%. The energy sector projected minimum decrease to 9.1% from 9.3%," it said in a report released in March.